Fatgirl Hedonist: Common Threads' Cooking For Life Festival Giveaway! Common Threads' Cooking For Life Festival Giveaway! Common Threads is a non-profit organization that is near and dear to my heart. I've written about them before and I'm now on their associate board member. 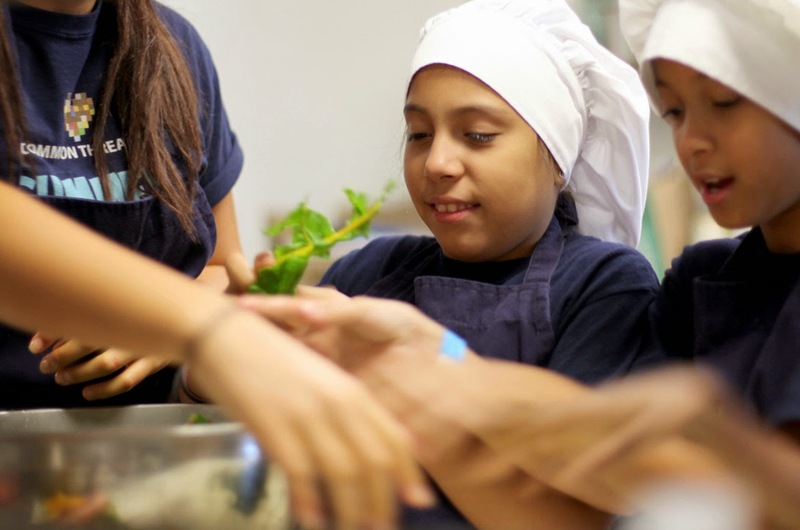 Common Threads' mission is to educate children on nutrition and physical well-being and to foster an appreciation of cultural diversity through cooking classes. Their goal is to teach children about how to make healthy choices, while educating them about the world. Common Thread hopes this will help children realize that they are all more similar than different from each other, which promotes respect and tolerance of all people. Their goal is a lofty one and one that is making a real tangible change right here in Miami with the 305's youth. However, making changes in the way people eat, cook and look at food is not easy and it's definitely not cheap. So the folks at Common Threads have put together a weekend long fundraiser so they can continue to work towards making Miami's youth eat healthier. The fundraiser is aptly titled the Cooking For Life Festival. The Cooking For Life Festival is happening on April 17, 2015 - April 19, 2015. The festival kicks off with dinner at Mignonette on April 17, 2015. The restaurant has agreed to donate 10% of all proceeds from that night's dinner service to Common Threads, so be sure to make a reservation! After boot camp, you need a good hearty meal to recouperate. Right?! So to remedy that, Common Threads has put together a lil ol' dinner at the Shelborne Wyndham Grand South Beach with Chef Masaharu Morimoto... maybe you've heard of him? VIP tickets are available for $125 and will grant you early access to chefs' bites of food, champagne and special sushi selections from Chef Morimoto in a VIP lounge. Not interested in VIP, general admission tickets are available for $75. After so much food on Saturday, you need a little yoga in yo life. Y'know stretch it out to make room for more food. Common Threads has put together Sunrise Beach Yoga at the Thompson Miami Beach on 4/19 at 8am. All participants will walk away with goodies from Athleta, Lifeway Foods and ZICO! There is a suggested $20 donation for the class, DASSIT. Wrapping up the festival is the Beach Side Brunch at Thompson Miami Beach on 4/19 at 11am. A hand-picked group of the country's top chefs will be traveling to Miami to support Common Threads and cook their favorite brunch dishes. All guests will dine on the culinary creations from Michelle Bernstein, John Besh, Stephanie Izard and Fabio Viviani. A special VIP event will give a few lucky guests the opportunity to meet and greet with the chefs before brunch is served. Brunch will feature amazing food and an exciting auction! Prices for the brunch are $250 for VIP (includes a one-hour exclusively intimate meet and greet with the chefs before brunch) and $150 for general admission. Now I realize that this festival ain't cheap, so this is where I give you that FGH hook-up. The amazing people at Common Threads have given me 2 general admission tickets (value of $300 total) to the Beach Side Brunch to give away to YOU! Winner will be selected on Friday, April 10 2015. My all time favorite choice to eat for brunch is Eggs Benedict alongside a Mimosa. I hope to have the opportunity to attend this brunch. I have recently heard of this organization and find their cause to be important and I truly support. Thank you for this opportunity to enter :0). This would be amazing! My fingers are crossed! My daughter participated in a Common Threads cooking class at her school. It's an amazing program! She was previously a very picky eater, now she's much more open to trying new ingredients and foods. Chef Karen is awesome! We'd love to win this. Our favorite brunch foods include french toast and fresh fruit. My favorite brunch food is scrambled eggs with sausage links covered in gravy. My favorite thing to have for brunch is an everything bagel smothered with garlic cream cheese and topped with salmon lox, avocado, a poached egg and Sriracha sauce. For dessert, captain crunch pancakes with leech condensed. A bloody Mary to drink as well! My favorite thing for brunch is an everything bagel smothered with garlic cream cheese, topped with salmon lox, avocado, a poached egg and Sriracha sauce. For dessert, captain crunch pancakes with leche condensada! A Bloody Mary to drink as well! This would be delicious!! French Toast is always a brunch favorite!! Unbelievably delicious pancakes or eggs benedict!!! I love you FatGirlHedonist! I started following you last year when I voted for you as Best Food Blogger for JWUZest. I am a Johnson & Wales Alumni. Congrats for that Award! As you will see via Twitter, I have long followed Common Threads. They are an amazing organization who deserve more recognition. I'm sure through your new role as Associate Member [Congratulations to that- we'll toast to that at Brunch!] you will shed light to those who don't know about Common Threads' great mission. PS. Did I mention I EAT Mimosas for Brunch, whoops I mean Bloody Mary's... WHOOPS There I Go AGAIN- What I meant to say was Ricotta Pancakes from Bocce Bar. I love eggs for brunch. I recently had eggs benedict with crab. It blew my mind and taste buds! So right now that is my fav brunch dish! A fresh veggie omelet with toasted sourdough and a big fat warm cinnamon roll as dessert! A veggie omelet with toasted sourdough and a warm gooey cinnamon roll for dessert!